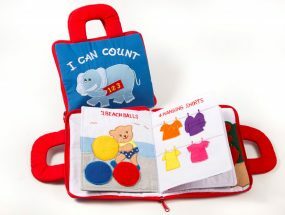 Learn your abc with this wonderfully colourful interactive Fabric Playbook. 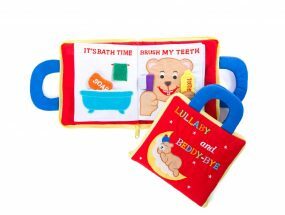 Each page has an activity to let your child play and learn. It is light and easy to carry around so perfect for car and plane journeys. 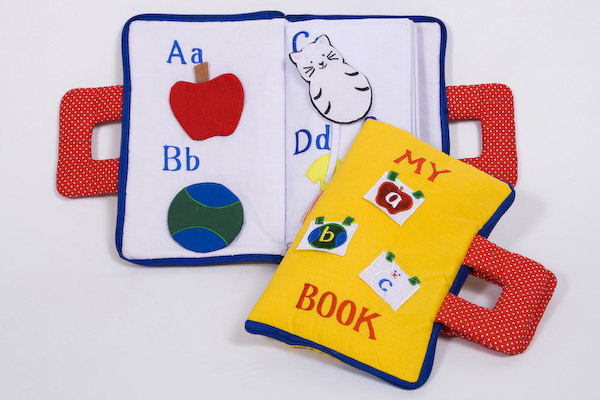 This abc Fabric Playbook is packed full of activities to help your child learn the alphabet. Each page has mascots on velcro to represent the letter i.e. a little blue elephant to take off and put back for the letter “e”. There are other activities too with zips to undo, laces to tie, glove to put on etc. The book all zips up and has a carry handle so perfect for taking on visits and journeys.